What Do People Think About During a Near Death Experience: Three Things to Do While You Can. The ambulance speeds across town, the driver is hoping to get me to the hospital in time. I can hear the sirens wailing. There are two people in the back with me, one seems unmoved by my condition, the other is wiping the tears from my eyes. “No one is going to die tonight,” she tells me. Her eyes aren’t very convincing. I’m having a heart attack. Ninety-five percent of cardiac arrest patients will not survive. I’m not going to survive. It’s my last hour. What will happen to my children? As I shared in a previous post, I went to the hospital and was told that I was having a heart attack. Fortunately for me, I was not having a heart attack. I am thankful for the outcome, but I believed the EMS staff when they told me that I was experiencing cardiac arrest. Having a history of heart issues in my family, I am aware of the survival rates. I thought there was a good chance that I might die that night. What was I thinking about during my last moments in the back of the ambulance? Truthfully, I was thinking pleasant thoughts. I thought about the fact that my family would be financially secure. I thought about how well my children were doing in school and imagined a pleasant future for them. My thoughts in the back of the ambulance were, I guess, what they should have been. I have life insurance. I have health insurance. My dying, for my family, would have only been an emotional loss. They would miss me. They would grieve. But they would start the process in a good place financially. A close friend of mine died about a year ago. In less than a year, his wife is in jeopardy of losing their house. I read an article about two sisters that had to endure a custody battle after their parent’s death because their parents had not planned for who would care for them in the event of the parent’s death. Finally, a family vacation turned tragic after a mother falls off a roof ledge and dies from her injuries. We know not the day, nor the hour that our time on this earth will end. When I thought my end-time was near, I thought pleasant thoughts. I was certain my family would be okay, and that extended family would support them. I want to offer a few things to consider. I know that I am writing to the choir. However, sometimes the choir members know people that they can pass the word on to. More than fifty-five people die each year worldwide (Worldmeters, 2018). So, out of the 6850 people that die every day, 3292 die without any life insurance at all. Another 1445 die without adequate insurance by their own admission. So, 48% of people who die every day leave no life insurance benefits behind and another 21% don’t leave enough (their calculations, not LIMRA), (Hinerman, 2012). I am not an insurance salesman. If I was an insurance salesman, I would say that people need to have life insurance. A recent LIMRA study says that 52 million people who make between $50,000 and $250,000 in annual income don’t have any life insurance. Just with that figure alone using my math means that 1139 people in that income range die every day without life insurance (Hinerman, 2012). Some feel that life insurance is too expensive. There are reasonably priced policies. 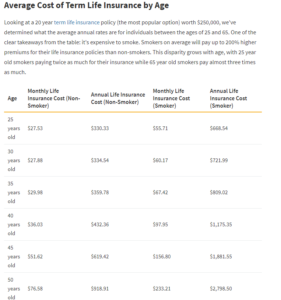 Below is the average pricing for a $250,000 life insurance policy. It is really a question of values and priorities. Life insurance can be affordable. Life insurance is good to have as a replacement for a caregiver’s income in the event of the caregiver’s death. In addition to leaving a family with financial support, it is very helpful to arrange your affairs so that things are easy to find. Everything that I have is listed for my wife and children, extended family in the event of my death. They will not have to search the entire house looking for everything I owe, own, have, and leave behind. They just have to find a folder that has all my accounts, passwords, everything and anything about me that they need after I die. Trust me, doing this for your family will be helpful. I see it all the time. Families go on a scavenger hunt trying to piece together bank account information, life insurance policies, outstanding bills, simple affairs when it can all be avoided by having a “in case of my death” folder. Some have happy thoughts when they know their time on earth is coming to an end. They are anxious to meet the Holy Father. Some people have pleasant thoughts about a well-lived life. I had pleasant thoughts about my family being in a good financial position and being left in the care of an extended family that will support them through the grievance period. Plan to the best of your ability for your death. Learn the difference between whole and term insurance. Research financial planning. Establish a will that outlines your affairs and wishes. Your thoughts during your final moments should not be thoughts of regret and worry about leaving your family behind. Finally, tell people that you love them now. Celebrate life while you are living. If you plan now, perhaps you too will have pleasant thoughts when the time comes. Next story In the Stock Market Jungle? How Do You Survive?